Recently I read a short piece about whether or not one should give a baby a very ethnic name. It spurred in me the remembrances of my own growing up. I was called “Judy” then, and it didn’t take long to get from “Judy” to “Judy-Doody,” to “Rooty-Tutti,” to “Tutti Fruity,” and finally to “Fruitcake” (a pejorative in the 60s and 70s, used for a person who was considered stupid, slow, or just plain weird). And that doesn’t even begin to address the number of times I was assaulted with “Judy, Judy, Judy” (a la Cary Grant, except he never said that), “Hey, Jude,” and (the worst), “Judy in Disguise (with glasses! ).” If there is one thing that kids know how to do, it is how to mangle your name into something that can make you feel bad about having been born. It was when I was in my 20s that I was told about the story of Judith, which was rather weird because the person who told me about it was a self-confessed pagan and I had grown up Roman Catholic. 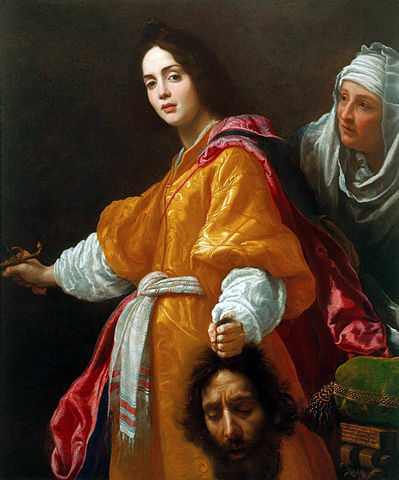 I’d seen the Cristofano Allori painting of Judith holding the head of Holofernes and I said to my friend, “Great! Here’s another picture of a weird woman named Judith!” At this my friend told me of the Book of Judith (as it appears in the Roman Catholic version of the Bible; it is one of the five apocryphal books). I dug up an old Bible and read it. I loved it. The story is a clever one! Judith saves her people in a clever plot (that would take too long to describe here). She is brave. She is beloved. All of this brings me to one point: Love yourself. Love your name, love who you are, love everything that makes you and your name one special being. Anyone can make fun of a name — it’s a childish thing to do, after all — but no one else can define it as you do.